By Jeff Aranow: IBF lightweight champion Richard Commey will be out for the next six weeks because of a hand injury, so he’ll e unable to face WBA lightweight champion Vasyl Lomachenko in a unification fight on April 12, according to Boxingtalk.com. 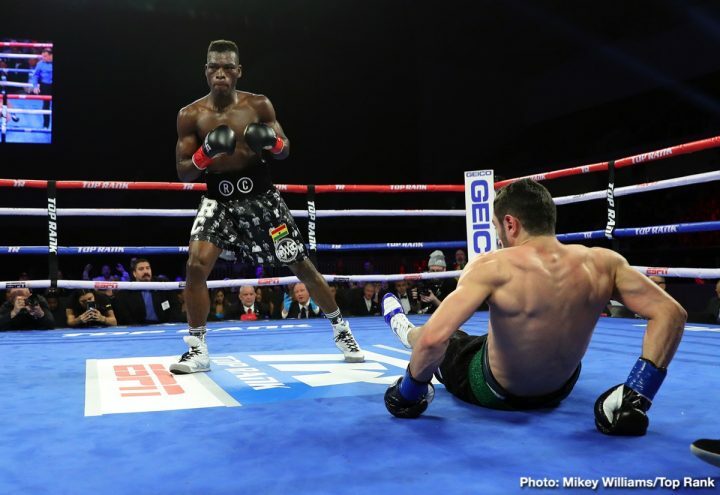 Commey, 31, will be out for six weeks while healing from the injury, according to promoter Lou DiBella. Lomachenko’s promoters at Top Rank Boxing will look to reschedule the fight. They want WBA/WBO lightweight champion Lomachenko to unify the division. The next move for Lomachenko (12-1, 9 KOs) is expected to be a title defense of his World Boxing Association 135 lb title against his WBA mandatory challenger Anthony Crolla (34-6-3, 13 KOs). That fight probably won’t happen though, since Lomachenko fights on ESPN with Top Rank, and Crolla on DAZN with Matchroom promoter Eddie Hearn. The fight would go to a purse bid, and it would come down to whether Matchroom could outbid Top Rank. Even then, this thing could get delayed long enough for Commey’s knuckle injury to heal up. At that point, Lomachenko would face him in a unification fight in the summer. It’s clear the end game for Top Rank promoter Bob Arum is a fight between Lomachenko and unbeaten lightweight contender Teofimo Lopez (12-0, 10 KOs) next year with all four 135 lb titles on the line. Arum thinks that WBC lightweight champion Mikey Garcia (39-0, 30 KOs) will vacate his title after he challenges IBF welterweight champion Errol Spence Jr. (24-0, 21 KOs) on March 16. Once that happens, Lopez will have a good chance of going after that title with the help of the WBC. Once Lopez has the WBC title, he can face Lomachenko, who will likely have dethroned Commey by that time to take his IBF belt, and the two can face each other in 2020 with all 4 lightweight titles on the line. A purse bid is reportedly has been scheduled for next week on February 13 for the Lomachenko vs. Anthony Crolla fight. Crolla’s promoter Eddie Hearn is going to try and win that purse bid and then stage the fight on the DAZN platform, which of course will be problematic for Lomachenko, who fights on ESPN. If Hearn wins the bid, he surely put the Lomachenko-Crolla fight on DAZN, which would put Top Rank in a position where they might need to have Lomachenko vacate his WBA belt. It’s impossible to imagine Top Rank letting Lomachenko fight on a different platform than ESPN. Lomachenko would still have the WBO belt if he vacates the WBA title. It would obviously slow Lomachenko’s plans of unifying the 135 lb weight division, but it was never going to be easy to do because of the different networks involved with guys like Crolla. If the Lomachenko vs. Crolla fight does happen, there’s a good chance it’ll take place in the States the Staples Center in Los Angeles, California. Commey (28-2, 25 KOs) suffered a injury to knuckle on his right middle finger last Saturday night on February 2 in his fight against Isa Chaniev (13-2, 6 KOs) in fighting for the vacant International Boxing Federation lightweight title at The Ford Center at The Star, in Frisco, Texas. The injury occured in the 2nd round of the fight when Commey knocked Chaniev down twice before the bout was stopped by the referee. Former WBA lightweight champion Crolla, 32, earned the WBA mandatory position by beating Daud Yordan by a 12 round unanimous decision last November. However, Crolla isn’t someone that the boxing public outside of the UK is too excited at seeing challenge Lomachenko. Most fans see that fight as a terrible mismatch, and they’d much prefer to see Lomachenko defend against someone that has the power, size and talent to give him something to think about like Luke Campbell, Teofimo Lopez or Devin Haney. Those are guys that would at least be competitive with Lomachenko. Lopez might even knock Lomachenko out. However, Top Rank Boxing promoter Bob Arum says he has plans of matching Lomachenko against Teofimo in 2020. Arum wants to have Teofimo target the WBC belt, which is still being held by Mikey Garcia. Crolla has won his won his last three fights since losing twice in a row to Jorge Linares in 2016 and 2017. Crolla’s wins since then have come against Ricky Burns, Edson Ramirez and Daud Yordan. Crolla is a good fighter, but he’s just not in the same talent class as guys like Lomachenko or Teofimo Lopez. Those two are on another level than Crolla. Jose Pedraza is another guy that would have to be viewed as being better than Crolla. There’s money to be made for Crolla in a fight against Lomachenko. That’s likely what this is all about. Crolla can’t see himself beating a talented fighter like Lomachenko, but he’ll get a huge payday due to the interest in the UK. It would be one of Crolla’s biggest fights of his career if not the biggest, but one that he’ll unlikely win.